Solenoid is the generic term for a coil of wire used as an electromagnet. 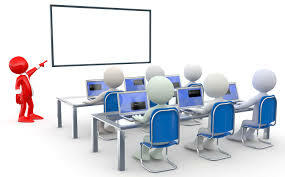 It also refers to any device that converts electrical energy to mechanical energy using a solenoid. The device creates a magnetic field from electric current and uses the magnetic field to create linear motion. Common applications of solenoids are to power a switch, like the starter in an automobile, or a valve, such as in a sprinkler system. A solenoid is a coil of wire in a corkscrew shape wrapped around a piston, often made of iron. As in all electromagnets, a magnetic field is created when an electric current passes through the wire. Electromagnets have an advantage over permanent magnets in that they can be switched on and off by the application or removal of the electric current, which is what makes them useful as switches and valves and allows them to be entirely automated. Like all magnets, the magnetic field of an activated solenoid has positive and negative poles that will attract or repel material sensitive to magnets. In a solenoid, the electromagnetic field causes the piston to either move backward or forward, which is how motion is created by a solenoid coil. 1. A coil of many circular turns of insulated copper wire wrapped closely in the shape of a cylinder is called a solenoid. 2. 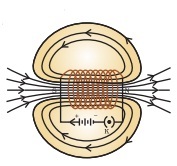 The pattern of the magnetic field lines around a current-carrying solenoid is illustrated in Fig.1. 3. The pattern of the field is similar to magnetic field around a bar magnet. One end of the solenoid behaves as a magnetic north pole, while the other behaves as the south pole. 4. The field lines inside the solenoid are in the form of parallel straight lines. 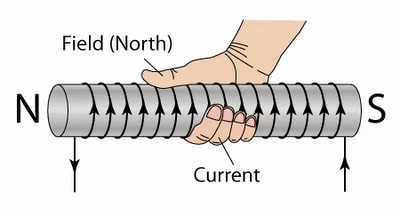 This indicates that the magnetic field is the same at all points inside the solenoid. That is, the field is uniform inside the solenoid. A cardboard, a circular coil, a battery, a key and iron filings. 1. Take a cardboard with two holes in it. 2. Pass a circular coil having large number of turns through these holes such that half the coil is above it and the remaining part is below the cardboard. 3. Connect the free ends of the coil to a battery, and a plug key in series. 4. Sprinkle iron filings on the cardboard and plug the key. 5. Tap the cardboard few times and observe the pattern of iron filings that is formed on cardboard. 1. You will observe that the field lines inside the solenoid are in the form of parallel straight lines. 2. When the current is reduced to 0, magnetic field intensity around the solenoid reduces to 0. 3. When we increase the amplitude of 'current' or the 'coil turn density', the magnetic field intensity around the solenoid increases. 4. When we reverse the direction of current the polarity of the solenoid is also reversed. Field lines outside the solenoid are similar to that of a bar magnet, and it behaves in a similar way – as if it had a north pole at one end and south pole at the other end. Strength of the field diminishes with distance from the solenoid.